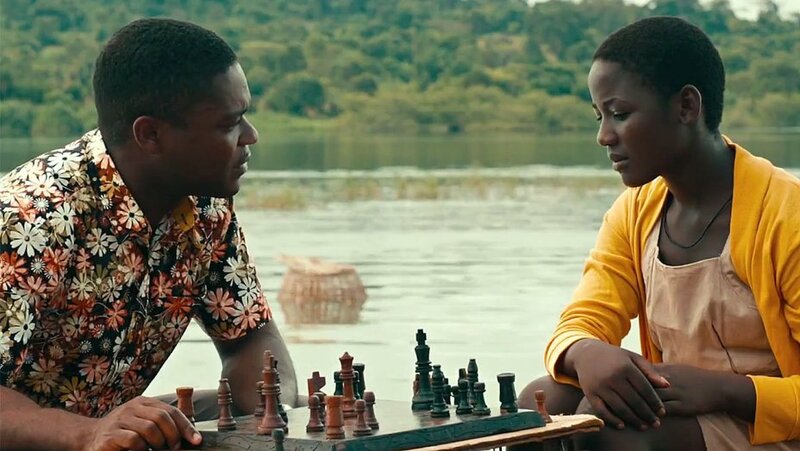 Queen of Katwe tells the story of a young girl, Phiona Mutesi (Madina Nalwanga), and how she went from barely being able to read and write to becoming a chess prodigy. She grew up poor in the slums of Uganda in a place called Katwe. Her mother, Nakku Harriet (Lupita Nyong’o), is struggling to make ends meet as a new widow and has her children help her sell vegetables and fruit to ensure she keeps food and a roof over their heads. Lupita Nyong’o does a great job of portraying a hard working mother who sometimes lets her pride get in the way of making her family’s life easier. Phiona sees a teacher by the name of Robert Katende (David Oyelowo) who runs a shelter for children whom he also teaches chess to. David Oyelowo is a pleasure to see on the screen as Phiona’s mentor. Phiona is intrigued by the shelter but does not know how to play chess. Robert begins to teach Phiona how to play and realizes that she is not only a quick learner of the game but a potential chess prodigy. The movie details Phiona Mutesi’s rise from the slums of Uganda to the chess olympiad in Russia. This movie also details the struggles her family went through while trying to make a life in Uganda. Overall, it was refreshing to see a movie about Africa actually take place in a natural environment with African actors. The children in this movie are fun to watch and deliver some funny lines in the film. This is an inspirational film about perseverance for not only kids but adults as well. I recommend you PAY to see this film in theaters. If you want to learn more about Phiona Mutesi’s story click here to read the ESPN article that helped get her recognize and eventually a feature film to be made on her life. Queen of Katwe arrives in theaters on September 23rd. Don’t get sold out and purchase your tickets now at Fandango. Have you seen Queen of Katwe? Share your thoughts below!